FRANKFURT, Germany — Shares in Deutsche Bank and Commerzbank rose on Monday after the two said they were in merger talks, but that didn't stop people from questioning what a merger would accomplish. 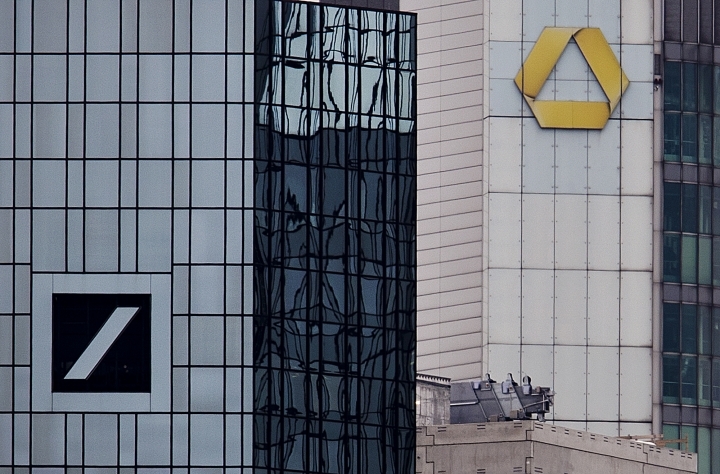 Deutsche Bank, Germany's biggest bank, and Commerzbank announced Sunday they would discuss a possible combination. News media reports have said Germany's finance minister, Olaf Scholz, favors a deal that would bring together two lenders that have been troubled over recent years, but unions fear that it could lead to major job losses. The German government deflected questions on the merger and wouldn't say whether it welcomed the announcement. "This is a decision by two private companies that have said they want to enter open-ended talks on a closer cooperation, and we as the finance ministry take note of that," ministry spokesman Steffen Hebestreit said in Berlin. Asked about perceptions of pressure from the ministry, he said: "I have perceived no pressure on the part of the finance ministry." Deutsche Bank could not even bring itself to use the word "merger" in its brief statement Sunday, instead referring only to "strategic options," and added "there is no certainty that any transaction will occur." One reason for skepticism is that both banks have been engaged in extensive overhauls of their businesses, raising the question of how they would integrate a new partner. Deutsche Bank made its first full-year profit in three years in 2018 and has been engaged in a drawn out effort to shed riskier investments, reduce headcount and streamline its computer systems. The bank is pulling back from a decades-long effort to compete with U.S. Wall Street banks, an expansion that soured after the bank was caught up in financial scandals involving money laundering and bonds based on mortgages to people with shaky credit. Settlements and fines cost the bank billions. The slow pace of restructuring led to the departure of CEO John Cryan last year and his replacement by Christian Sewing. The talks take place against a background of German government statements favoring "national champions" — businesses that are big enough to compete globally. The German government still has a stake of some 15 percent in Commerzbank, which received aid during the financial crisis. Commerzbank, which has long relied on a steady business lending to German small and medium-sized businesses, has had to write off billions in bad shipping loans but made 865 million euros last year. Banking expert Wolfgang Gerke said on n-tv television that a merger makes "absolutely no sense" because the two banks are "so occupied with existing burdens." Tom Kinmonth, senior fixed income strategist at ABN AMRO, wrote in a research note that "the creation of a new bank is going to be monumental task to generate profitability" starting with two banks that already have weak profit measures. The deputy head of the opposition Left party delegation in the German parliament, Fabio De Masi, said that "two sick turkeys do not make an eagle." Shares in Commerzbank rose 7 percent to 7.65 euros in early afternoon trading in Europe. Deutsche Bank climbed 5 percent to 8.22 euros.